“Only let each person lead the life that the Lord has assigned to him, and to which God has called him” (1 Corinthians 7:17, ESV). This admonition is given in the context of believer/unbeliever marriage. The Apostle Paul explains that if one marriage partner gets saved and the other doesn’t, the Christian should remain married to his or her unbelieving spouse because the marriage vow is a sacred one, even between unbelievers, and because the believing husband or wife can be a witness to the unbelieving one. So, following Jesus isn’t an excuse to escape your marriage commitment, even if your spouse remains an unbeliever. This admonishment stands in contrast to Paul’s caution in 2 Corinthians 6 about believers being “unequally yoked” to unbelievers. In 1 Corinthians 7 a person is already married when he or she becomes a Christian while in 2 Corinthians 6 Paul advises persons who are already Christians not to become entangled with unbelievers. But the scope of Paul’s command reaches far beyond just the marriage relationship to the very core of our relationship with God when we become a Christian. In fact, in the following verses (vs. 18-24) Paul explains that God calls people to Himself from various stations in life: socio-economic status (slave or free), family status (divorced or married), and religious affiliation (circumcised or uncircumcised). So, your Christian life starts from whatever station in life that you are at. Where you are when you are saved is where God wants you to be! When you follow Jesus, your way of life, your life, becomes a calling from God. From there on it’s all providential! Your life is a heavenly assignment! Consequently, you must watch for God at work! You must look and see where God is working in you and around you and move in that direction. 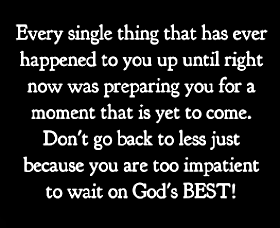 God has a plan and purpose for you. But, you start from where you are at. God may change your circumstances later, but today you are where God wants you to be. So, whatever your status, wherever your location, however your circumstances, that is the place your assignment from God begins! This entry was posted in election, providence and tagged Bible, providence. Bookmark the permalink.